A fantastic signed envelope by Gordan Cooper dated May 16, 1963 during the Mercury project days. He writes "Gordan Cooper Col. USAF Faith 7th".Accompanied by a Zarelli Space Authentication. 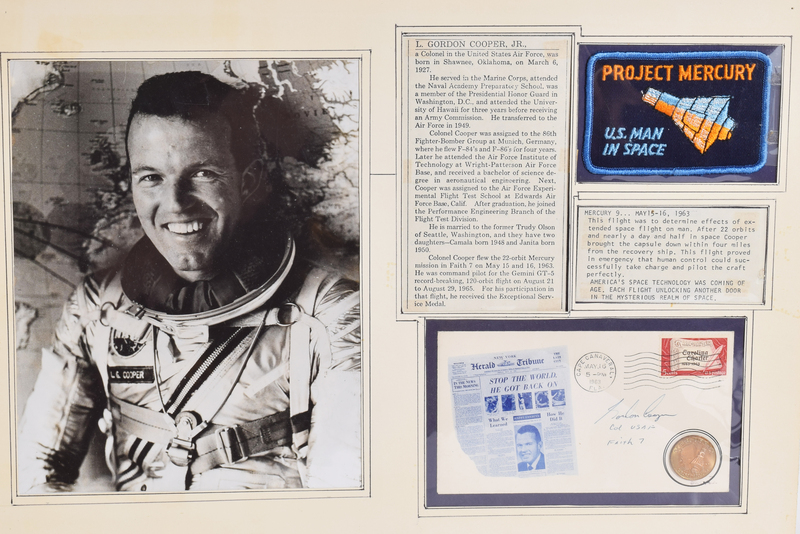 This is matted with an original project Mercury period Patch, information about Gordan and period photo of Cooper. The Crew Patch can be found on www.crewpatches.com, It is ID [MERUNK2] patch is 4 x 2¾" / 103 x 68mm, embroidered on blue twill. Merrowed edge with no 'tail' (selvedged). This is considered a rare patch and form period.